(CNN) -- A female graduate student at Virginia Tech was killed Wednesday night when a man she knew attacked her with a knife and decapitated her, a school spokesman said. Virginia Tech police Chief Wendell Flinchum talks about the first slaying on campus since the 2007 shootings. Virginia Tech spokesman Mark Owczarski said Thursday that Xin Yang's killing was the first on the campus since April 16, 2007, when a shooter killed 32 people before turning a gun on himself. Yang, 22, from Beijing, China, was killed at the Au Bon Pain restaurant in the Graduate Life Center at around 7 p.m., school spokesman Larry Hincker said in a written statement. Campus police took Haiyang Zhu, 25, into custody at the scene. The Ningbo, China, native has been charged with first-degree murder and is being held without bail at a local jail, Hincker said. 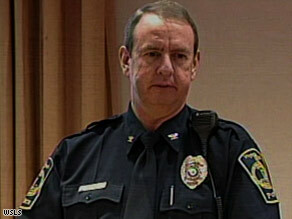 Zhu did not say anything to the arresting officers, said campus police Chief Wendell Flinchum. "There was blood on him," Flinchum said. The young woman and the suspect "were not seen arguing, or anything of that nature," he added, citing witness statements. Authorities said the two students knew each other. "Based on emergency contact records maintained by the university, it is known that Zhu and Yang knew each other," Hincker said. No other details were provided. The young woman arrived at the university two weeks ago to begin studies in accounting, he said in the statement. Zhu is a graduate student pursuing a doctorate in agricultural and applied economics. He began studies at Virginia Tech in fall 2008, Hincker said. "Our hearts go out to the victim and her family," President Charles W. Steger said in a letter to the campus community. "An act of violence like this one brings back memories of the April 16 tragedy and I have no doubt that many of us feel especially distraught." Authorities say on April 16, 2007, Seung-Hui Cho killed 32 students and professors before killing himself.